I'm a little late since Saturday, June 22 was the actual four year Coach-iversary with Coach Jim McGehee. It's been four years (and counting) of wonderful training, racing, and learning under his direction. I credit him with the fact that I am still going strong and enjoying the sport more than ever. He continues to demonstrate how to strike a healthy balance and perspective as a parent, spouse, son/daughter, citizen, and triathlete. I can't even find the words to say how glad I am to be a One-on-One athlete and to benefit from Coach Jim's knowledge and experience. I have a notebook with all 208 weeks of printed out TrainingPeaks workouts (yeah I'm just a little OCD). But those do not account for all the emails, phone calls, texts, meetings, and poolside chit-chats. I could seriously go on and on but if you've got a coach you really click with and who knows you well, I don't have to tell you what a luxury that is. I cannot imagine my participation in the sport without his involvement. If you'd like to learn more about Coach Jim, I did an interview with him on March 8, 2013 and on February 22, 2012 I did a post on the Roles of a Coach from A to Z, listing many of the things he does to manage his group of athletes! Happy Coach-iversary, Coach Jim. I look forward to filling lots more 3-ring notebooks with the workouts to come as I make my way up the age groups! 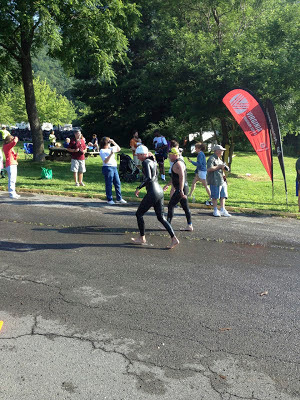 Saturday was my fourth year racing the Bath County Sprint Tri at Lake Moomaw near Warm Springs, Virginia. Four years?! I'm becoming one of those 'fixtures' I guess!! This race attracts many triathletes (like Tanya in the photo above) from our region so it was great to be there and to be able to join in on a picture-perfect morning with so many friends. 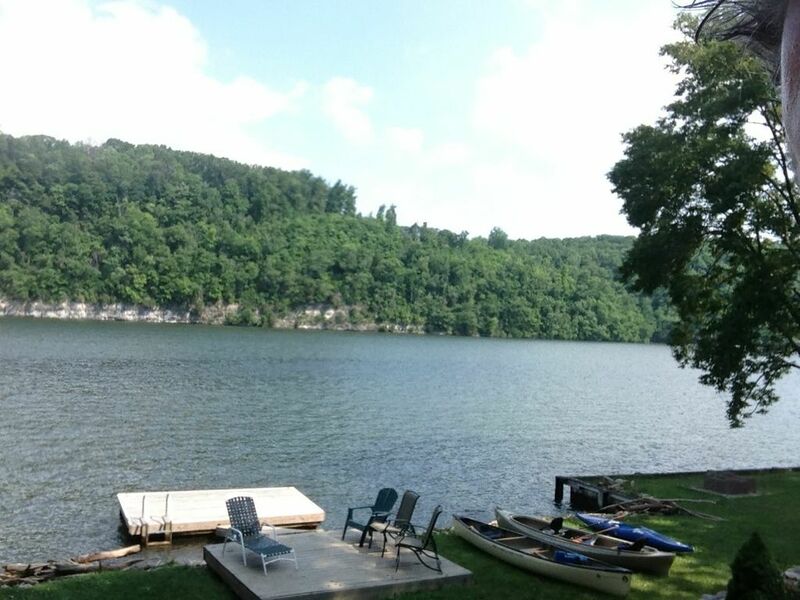 The lake was temperate in the mid-70's and as calm and clean as you could ever wish for. The out-and-back bike and run courses are rolling and challenging but safe and closed to traffic. It's a spectacularly gorgeous and unspoiled area nestled in the Alleghany Highlands of the Shenandoah Valley and such a treat to race there. 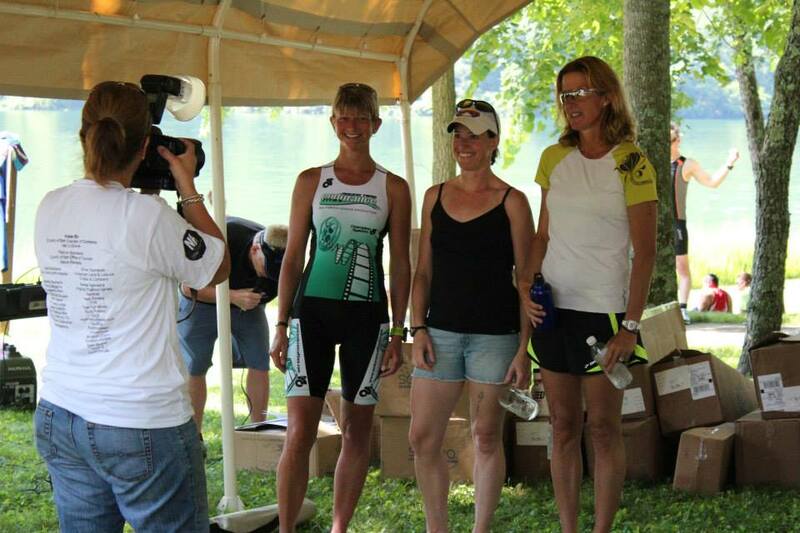 I was really happy to finish as the fourth woman out of 83. 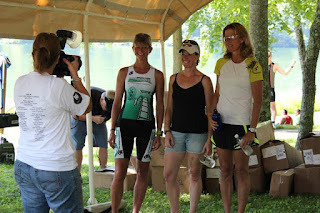 That also meant that three of the top four are from my town of Blacksburg, Virginia: Kate Buss (1st) and Edie Nault (2nd)! Full results online at SetUp. Race morning I was pretty calm. Having done so many races (this was #27) I've finally learned that I don't need to get worked up to race well and I've stopped worrying about not being worried!! When the air horn sounds, we all know what to do. A BIG win in the swim! This this was perhaps my best open water swim. Granted, swim courses can vary in distance from year to year, but I was nearly two minutes faster than last year, and where I was 2-1/2 minutes slower than Edie in 2012, I was less than a minute off her time this year. I am going to call this progress! 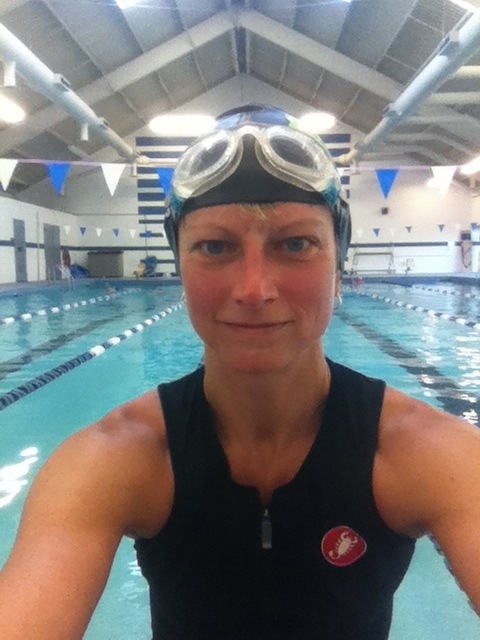 I felt like I swam strong, consistently, and even straight! It sure helped to have a flat, calm lake and good visibility. Right away I had the opportunity to draft off a slightly-faster than me swimmer and did so to the first turn buoy after which I went solo. I thought about getting the most out of each stroke, my arm entry, pulling toward my hip, and accelerating the pull. 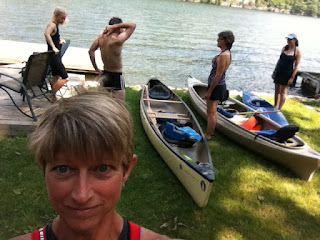 I kept my cadence up (Garmin said 39 strokes per minute) found myself passing plenty of swimmers from the previous waves. 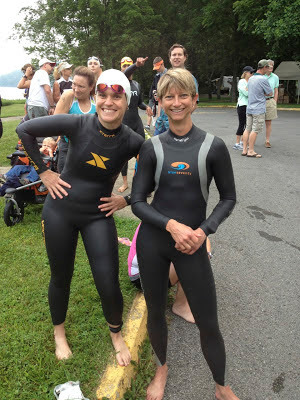 To finish in the top 11% of women and top 10% of men on the swim feels really good. 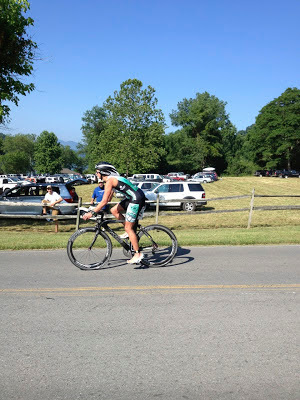 Instead of my usual imbalance of upper-mid pack swimming and strong bike/run, I was a bit more balanced at this race. I think a number of things have come together to start to improve my swim. Four years of patient help and the watchful eye of Coach Jim has of course been the foundation. 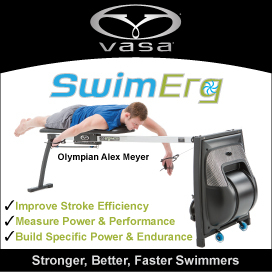 Then in January I added the Vasa Swim Ergometer to the mix with supplemental workouts through Vasa from Coach Eric Neilsen. For me the Erg has been a great tool that has enabled me to learn -- and to see for myself with the power meter -- how to generate swim-specific power. I'm working on "avoiding the single speed arm pull" that Coach Eric talked about in a recent blog post. 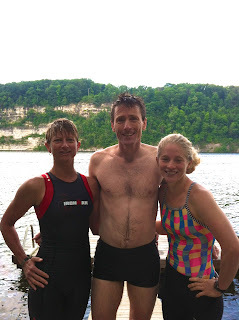 I also think doing the 2.5 mile swim a week prior in choppy lake water gave the the confidence and right mind-set to be more aggressive on the swim here. 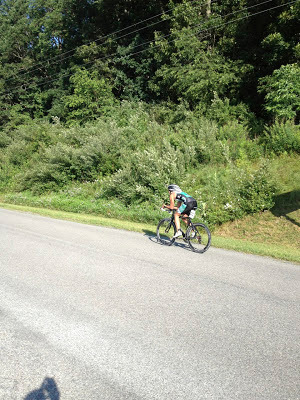 I had a pretty decent ride and run, but slower than last year. Frankly, my bike and run have not quite been where I would like them to be all race season. However, in this case, I was just happy to finish this race as well as I did because for the past two weeks I've been babying an overuse injury on my left quad. I'm not complaining or blaming -- it's just something to be managed, and comes with the territory. Recent runs had given me cause for concern, but I did my best to put them aside for the race. 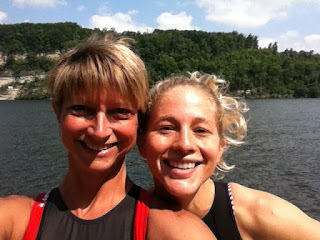 I left T1 behind fellow master's athlete Ellen Sortore and she took off strong on the bike! I told myself not to rush to catch her and just to work patiently and do my thing. In the final miles, Ellen and I passed and repassed each other numerous times which only left me more determined to secure the lead, which I did by only six seconds! It was fun though, and I appreciated the push from Ellen! The run here starts with a climb so I went conservatively up that first hill wanting to save my quad for later efforts. I passed a few walkers on the hill and kept my cadence up and drove with my arms. The mental pain of giving in and walking is far worse than the physical pain of keeping going. After that hill it seemed like a lot of going down-down-down and in your mind you just know that after the turnaround that means up-up-up!! One of my tricks is I keep my focus pretty close in so rather than thinking wow, I need to get to the top of that hill, I am just thinking of a few footfalls ahead. You don't notice elevation changes much if you are only looking ten feet ahead. I saw Kate coming back the other way and started checking for other girls. I saw Edie then one or two others so I figured I was in pretty good position. 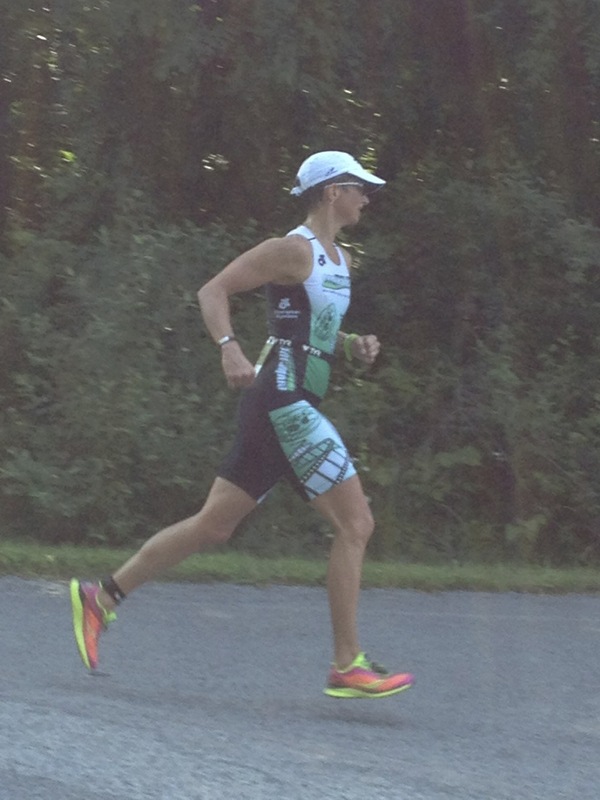 I had started at least two waves back from the under 40 women. 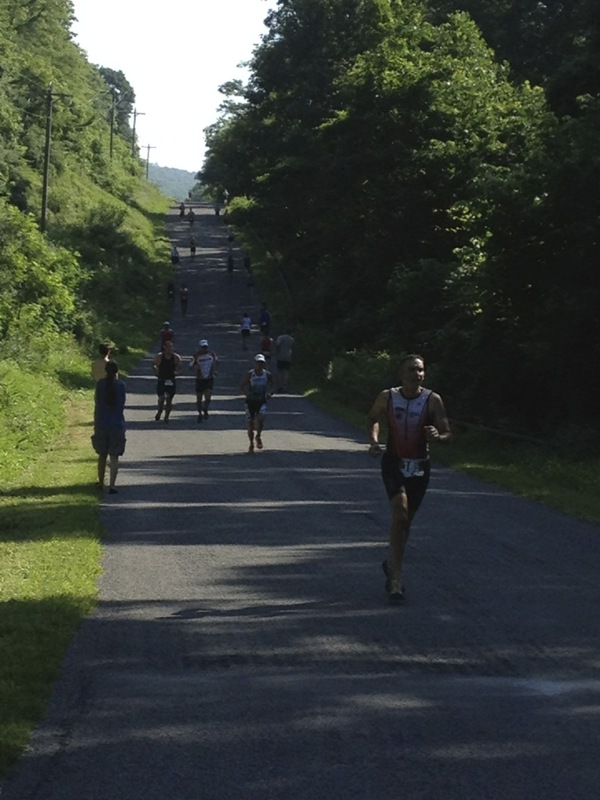 That final downhill is a fun one and it really sets you up to gun it into the finish! I was so relieved to have put in a good race, with no blowups, no major quad complaints, and no big mistakes. There is not a lot I would change about how this race went. Mike, Scott, and Mark (above) are three of the five "Crazy 8-s" who were at the race. 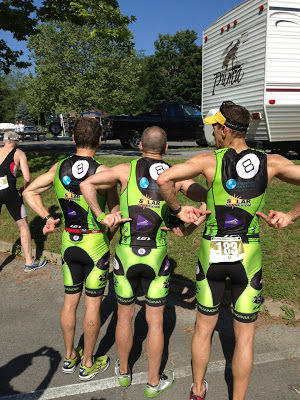 This group is training for IM Lake Placid and Solar Connexion is one of the sponsors of their very sharp kits! Edie and I got a few photos together. She will be graduating with her MS in Dietetics and will be leaving for Pittsburgh to start on her internship next year. She will be sorely missed but I'm very happy for this exciting new chapter of her life! Winners each received a "Moomaw Madness" camp chair! What a very cool award that will be much appreciated for years to come! These are the One-on-One athletes who raced minus Edie and Joe Hoff who were not available for the photo. We took this photo for Coach Jim who wasn't able to make it to this race this year due to travel. July 13 and 14 will bring my first "double" race weekend of the year at Colonial Beach with a Saturday Sprint and a Sunday Olympic. Between now and then I'm hoping to put the quad issue behind me and reclaim some speed. 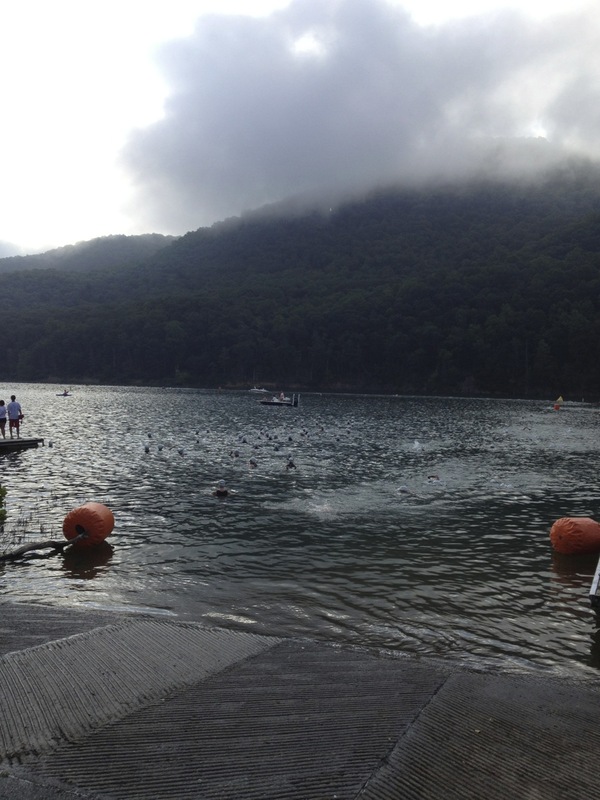 The good swim result this weekend has me fired up to continue my work in the pool, on the Erg, and in open water. I need to make every workout count and give it my full attention and best effort. I also need to pay attention to recovery - sleep, rolling, stretching, hydrating, eating. I am less than three month's out from Worlds and time is moving quickly! I'm looking forward to more great training and racing ahead! My cousin Carin is suffering from Runner's Knee and she found herself at the orthopedic doctor, waiting well over an hour in the exam room, then getting an xray (near worthless for running injuries but a hoop they make us jump through) and being sent home to "wait and see" how it is. That's the pretty typical scenario and she sounded justifiably frustrated. I started to think about all the things she can do in the meantime that may be more productive than "waiting" so decided I would pull them together into a post. Having been through my share of injuries (ITB, two fractures, shoulder impingement, drop foot, peronial tendonitis, hip issues, pulled hamstrings, piriformis...) and having been asked by others in the past about how to cope and manage, I thought I'd share a few things that I do to be proactive in my own rehab that might be helpful for others. In fact, in the last ten days I've been rehabing an overused and abused sartorius (front quad). It's always something, but part of the athletic journey! Like many, I believe a large number of typical runner's injuries are caused by areas of tightness and weakness that require compensation by other muscles/ligaments/tendons. They can compensate only so long and eventually something becomes overused to the point of pain and inflammation. The good news is that often there is more that can be done than just waiting. This is a big list of all I could think of, in no particular order. I'm not suggesting they all need to be used each time, but you can mix and match! Get The Trigger Point Therapy Workbook: Your Self-Treatment Guide for Pain Relief by Clair Davies, David Simons Amber Davies. My friend Sheila turned me onto this book that does an excellent job of saying if you hurt here, and if feels like this, look to these areas as the culprit. 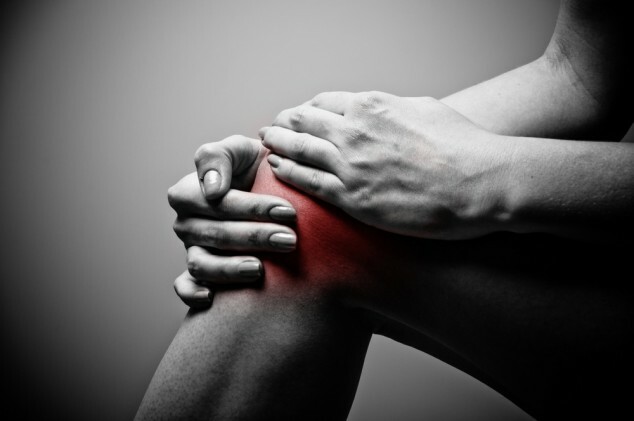 While you may hurt in your knee or foot or whatever, the issues may be further up the kinetic chain. It's nice to read the short case studies and be able to say, yeah, that IS what it feels like! 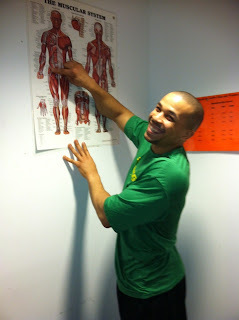 Then the book shows you how to massage the trigger points (basically tender areas of muscle/nerves) to break them up. 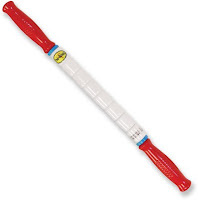 Use a quality hard foam roller and massage stick daily or even several times a day. 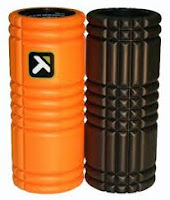 I like the Trigger Point foam roller and the "stick". It's not that hard to learn how to use them and the foam roller is a great relaxing evening thing to do anyway. Roll everything - back and legs. There are lots of videos out there on how to use them. Ice is a great tool. It's a pain, and it takes effort, but initially it's really important so get a system and make it as easy as possible for yourself. If it's a lower leg issue, stick your foot in a garbage can of water with ice. You can even make giant reusable ice cubes in ziplocks and just put those in the water. For other areas, get a quality gel ice pack (or several) and figure out a way to stuff them in a compression sleeve or wrap an ace bandage around them, or shove them down the back of your pants if it's your back. The key is to make it convenient. See a Sports Med DO (Doctor of Osteopathy) and/or Physical Therapist. Ideally they are or were a runner/athlete or they work with them. They will dig beneath the surface symptoms to find the root cause. DOs can do adjustments and manipulations and PTs can set you up with a set of rehabilitative exercises. (Contrary to popular belief for running injuries you can actually see a PT just one time or two and do the work at home). Then no matter how silly and weird the exercises seem, DO THEM. Consistently. See a chiropractor to get realigned and stay aligned. I've seen Dr. Tilley regularly for years and not only does he keep me structurally sound, he's a trusted advisor for my overall athletic health. Get deep tissue massage. When you are injured it can set off a cascade of tightness elsewhere. The rollers can only get you so far, but a qualified SPORTS massage therapist can break up trigger points, areas of tightness, and flush out the bad stuff. This is not a fluffy spa massage, these hurt, but it's well worth it. This year I've been getting fairly regular massage work (thanks, Mario!) and it's made a big difference. 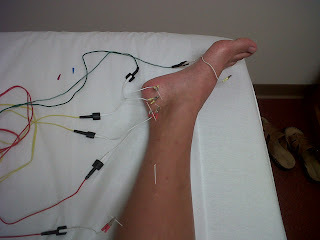 When you have a really stubborn tendon injury, consider acupuncture. This can break up established pain pathways and stimulate blood flow. This is especially useful for tendonitis problems that heal so slowly because they have very little blood flow. Sports tape can help. I'm a little less convinced of this but in the latter stages of healing and in the return to running, I think it just helps to have the distraction. Then your mind can focus on the pull of the tape rather performing a constant OCD assessment of pain levels. Compression may be useful. You can find compression garments and sleeves for nearly every body part now and not only does the support feel good when needed, they are also useful for holding ice packs in place! 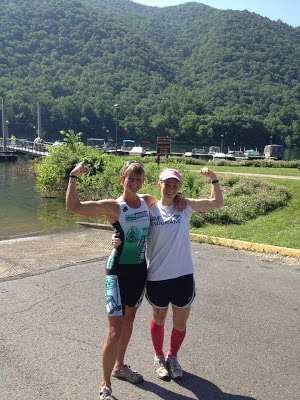 I have compression socks and just added compression quad sleeves. Strengthen areas that are contributing to the overcompensation area. A physical therapist is essential for prescribing the best course of action! Often the exercises are very small and simple movements that use bodyweight or just stretch bands. You don't have to be pain free to start the strengthening process. Dial in the nutrition and hydration and be sure your body is getting all it needs to heal. Adjust your intake to match reduced training. Do what you CAN do in terms of exercise. If you can't run, can you still bike? Swim? Lift weights? Work your core? Don't abandon your fitness because it is essential to mental well-being and happiness too. As you recover, begin planning for your return to running. How you can keep the injury from recurring and continue gaining strength. Do you need a better warm-up plan? Cool down? More stretching? Examine your running technique. Think critically about ways to improve. 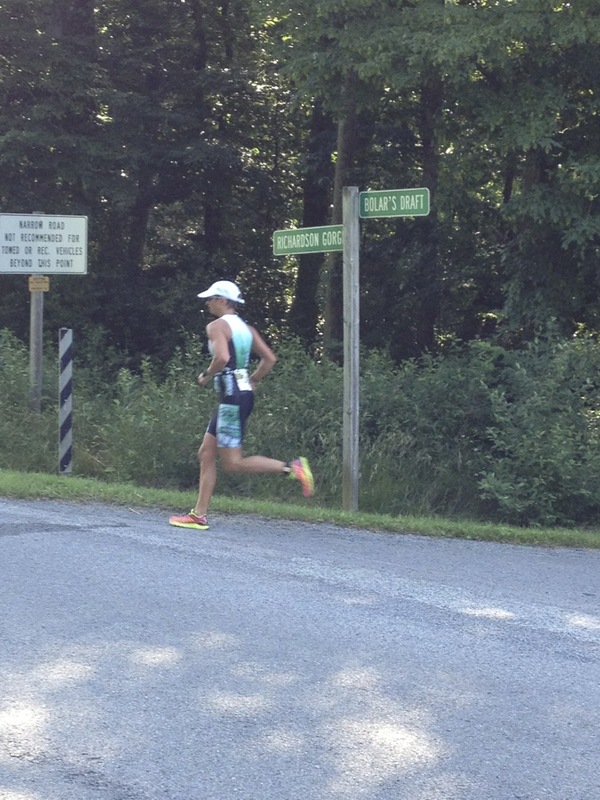 Do you need a quicker cadence to prevent overstriding? Are you underutilizing particular muscle groups? 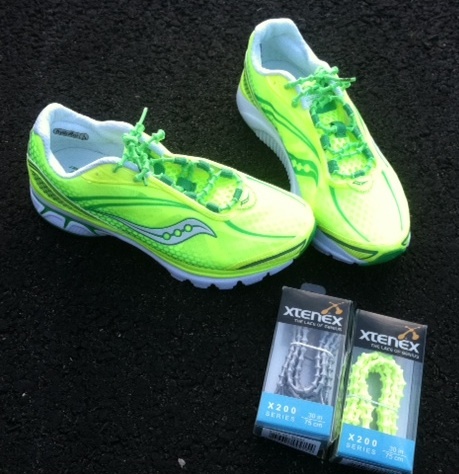 A professional video analysis from a qualified running coach can help. 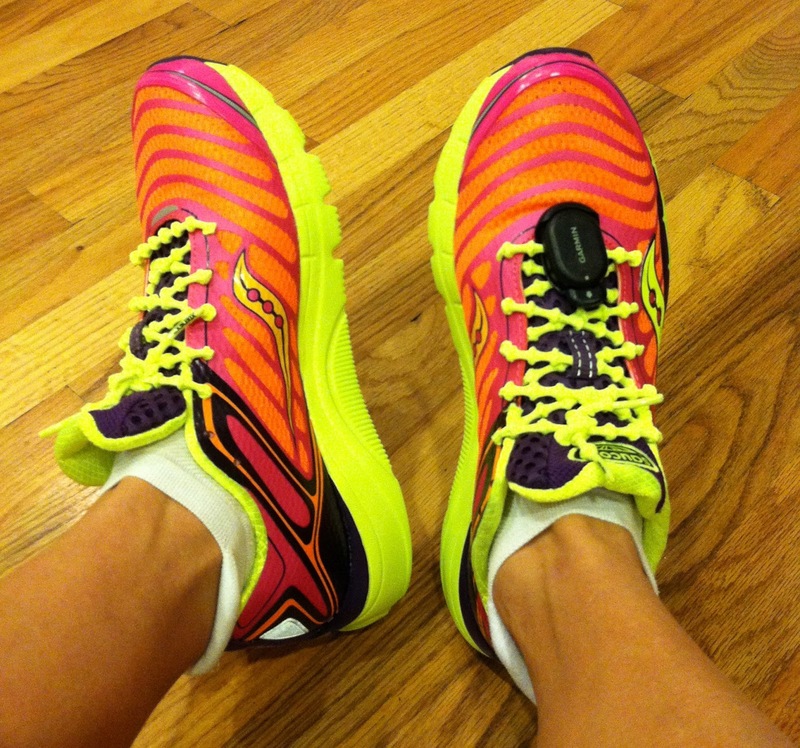 Get new shoes and consider a different model or brand. A little change-up in foot-strike might alleviate what led you to the injury in the first place. Return to running gradually. You don't have to be pain free-to resume, but go very slowly and start with a jog-walk cycle. Stick to level, non-cambered, smooth surfaces -- ideally a soft grass or mulch trail. Then ice immediately afterward and continue with the rolling, stretching, and exercises. Keep that up until you are running pain free. Stay positive, even if you have to fake your way through it. Be kind to those around you who are having to deal with your non-running self. There are more races and training days ahead. I have taken something positive and learned from every injury I have had and you will too. 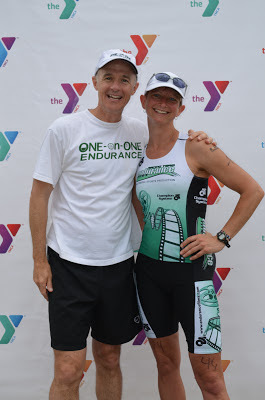 Heck, it was a running injury that led me to triathlon!! Finally, COMMIT to your recovery and healing! Be proactive! Do the regular icing, stretching, massage, rolling, and strengthening. Do what needs doing like it's a part-time job and have faith that in time, you WILL get through it, because you will! Chosen ones, unblemished in a box. Carrying the dream of 5K and 10K PRs. Welcome my unsocked feet in T2. Lift me up unforgiving hills. With high turnover and effortless flow. Or ‘you are not so tough today’. All within your meshy upper. For sprint and Olympic swim, bike, then run. Driven by strength, purpose, and EVA soles. Eyes on the prize, the final 100 meters. Kick to the finish, go strong. Dream it! Do it! Let's go! But first, out of the box. The name Castelli has long been associated with cycling, but only recently has come to the triathlon market. As their website says, "We're new to triathlon, but we're coming in as a recognized speed leader in cycling and we're working hard to make you faster from the starting gun to the finish line." 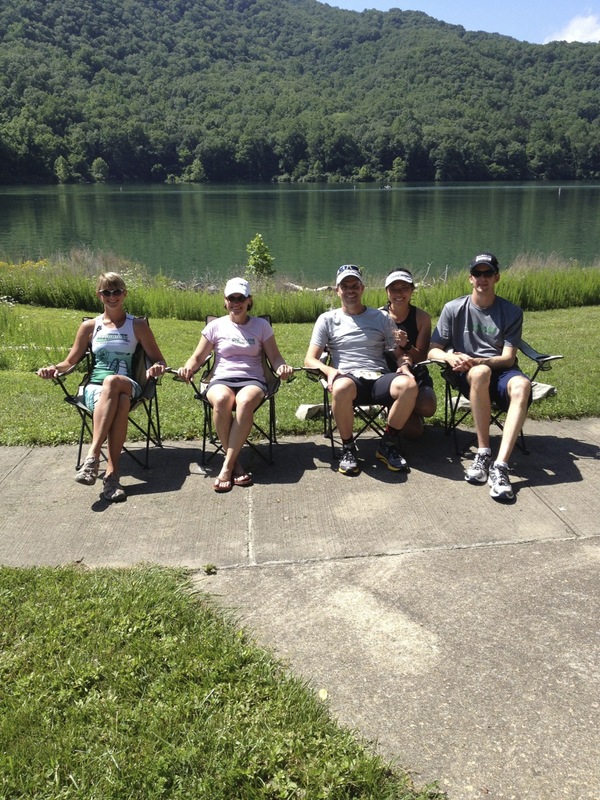 Castelli partnered with K-Swiss this year as a sponsor of an elite triathlon team that includes Timothy O'Donnell, Mirinda Carfrae, Leanda Cave, and the Raelert Brothers. I was fortunate to get to try their two new lines - the "Free" (photo above in red/black/white) and the "Bodypaint" (all black) collections and can give some feedback on them both here. First off I can say these are true to the size charts (yay!). I was exactly the measurements for a medium and the mediums fit very well (I'm 5'7" and 129 lbs as a reference point). I've needed a large top in other brands so one can't be too sure. 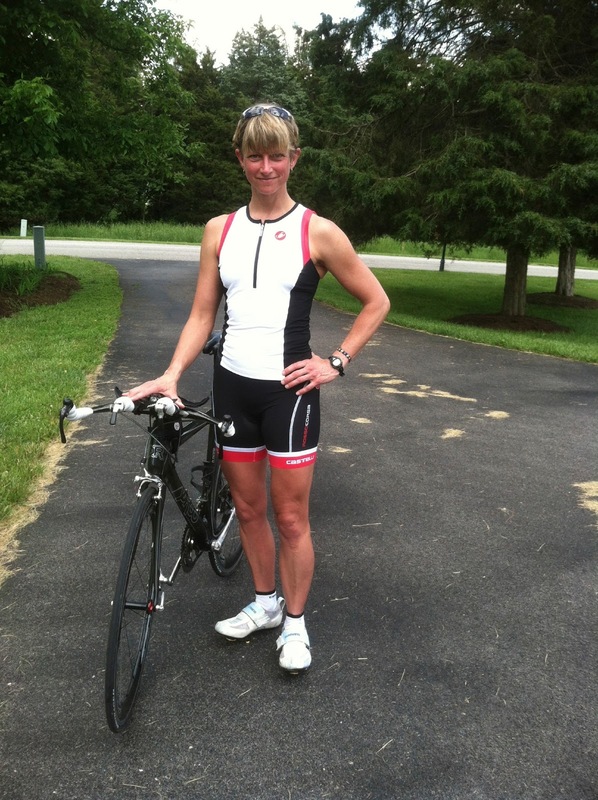 The Free set (black/red/white) is hands-down a new favorite two-piece tri kit, and I have worn a number of brands over the years. The name "Free" is well deserved as it is ultralight, comfortable, and non-distracting, allowing me to focus on my workout rather than the fit of my kit. It's like wearing butter. If butter were wearable. It's pretty flattering and eye catching. 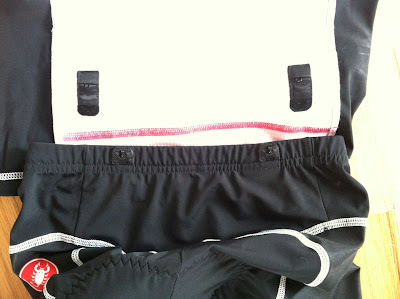 The two slanted rear shirt pockets don't catch water and make it easy to access gels and supplies. I'm a big fan of the topstitching on the tri-shorts, and that along with the red Castelli leg grippers breaks up the rear view. The shorts have a rise that is high enough but not too high. 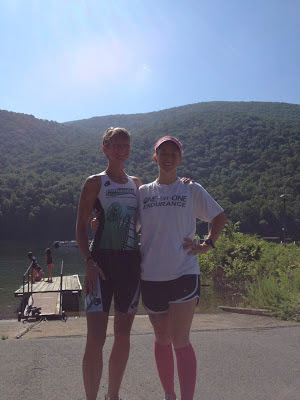 I think some manufacturers have gone too far in a low-rise hip-hugger tri short (especially in front) which is OK on the bike but if you are tall like me on the run, that just means midriff exposure, which moms do not appreciate! 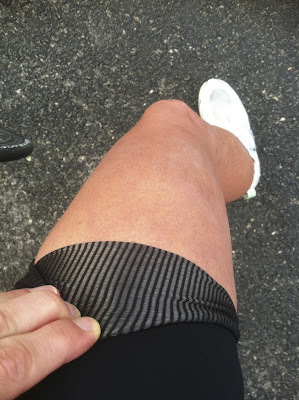 The best thing about this kit is the clever inclusion of the hook-and-eye option that allows you to connect the bottom back of the shirt to the top of the shorts in two places to keep things in place and prevent sunburn on the bike. It gives the coverage of a one-piece with the easier access of the two-piece. I've worn this kit on several bricks including one in which I was in a downpour on the bike and especially with the mesh-like back of the top, it dried very fast for the run that followed. It's pretty much my go-to kit for brick workouts now. The Bodypaint kit is a heavier material and currently only comes in all black (that is expected to change in the next collection). 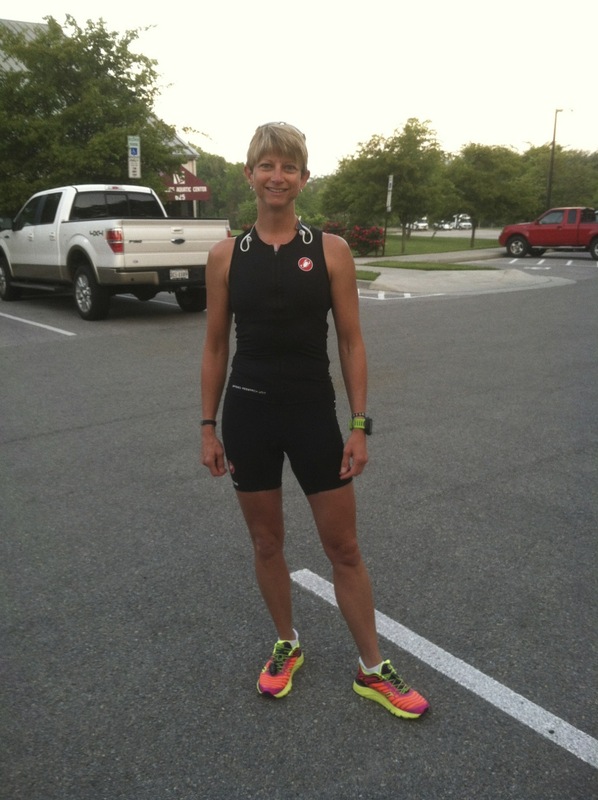 When I'm out biking and running, I want some degree of visibility for safety reasons and so I am hesitant to wear all black to train. The nice thing about the bottoms is they have no seams and the leg-gripping surface is integrated into the leg. They are very comfortable and I've been choosing these tri shorts for my long bike rides with no chaffing! The heavier, slightly compressive fabric of the Bodypaint top was more than I prefer for training. That said, if I were at a cold race -- one of those where we are contemplating putting plastic inside our tri tops as a wind break -- I would like this top. However, it felt as if with the bit of stiffness and despite the grippers at the bottom of the tri top, it had a tendency to shift/rotate a bit on the run and swim. That could also just be a fit issue particular to me. The arm sleeves and socks, like the Free line, are also like "wearing butter". They are the softest things ever. 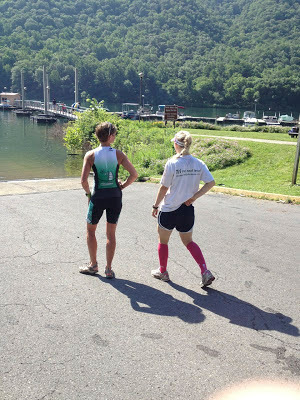 The arm sleeves are a nice extra layer for cooler training and a good lightweight sunscreen in the summer. This photo is a reflection in my minivan window. 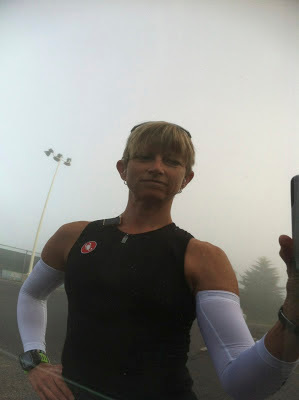 I just thought it was cool, and shows the arm sleeves that were much appreciated on this cold, foggy, morning ride. You can't see the Castelli name down the side, but they look good. RIP Castelli sock. Luckily they sent two pairs so I still have three good socks out of four. All-in-all, I'd have to say that Castelli has done well with their introductory tri line. It offers two distinctly different kits - the ultralight, stretchier Free collection and the Bodypaint pieces that are more compressive. I appreciate Castelli's innovations like the hook-and-eye top/bottom attachment, the angled rear pockets, the seamless Body Paint short, and the overall cut and fit. 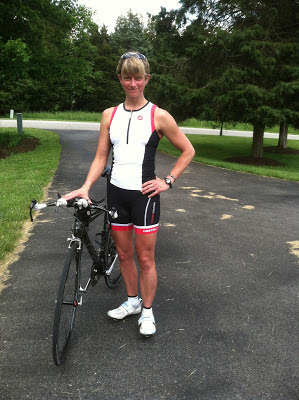 Both sets also offer a one-piece tri kit and a cropped top. Find out more about Castelli's triathlon products online at http://blog.castelli-cycling.com/docs/triathlon/ or find them on Facebook! Never a dull moment...never! Yesterday I woke up with a bright red eye and eye pain, diagnosed as good ol' fashioned pinkeye. It pretty much thwarted my gym plans but I decided that was no excuse to skip a session. I had enough stuff at home to put together a sufficient workout for back/biceps/shoulders as intended. The point of this post is not to imply that there is something particularly great about this exact workout because there's not. It's just what I came up with on the spot. It's more to suggest that when plans go awry, just apply a little creativity. My inspiration for this is fellow blogger Josie at Yum Yucky who creates killer workouts in her living room on a daily basis. What I had to use at home were 15 and 25 lb dumbbell sets, a handled stretch cord, a chair, the Vasa Swim Ergometer (with handles rather than power paddles) and our pullup bar in the basement. Strength training need not be complicated. It's simply a process of reminding muscles they have a job to do by providing resistance. 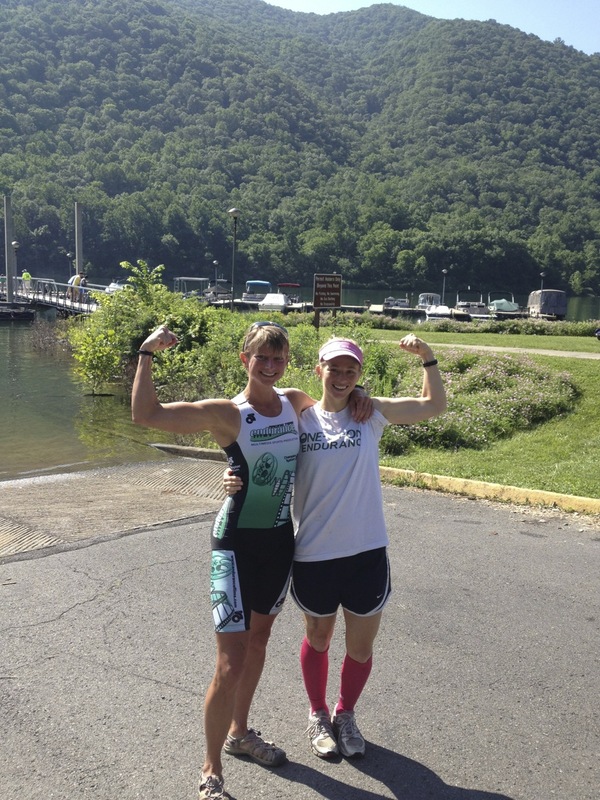 It helps us learn to recruit more muscle fibers, and it's an opportunity to work things that aren't primary participants in swim/bike/run but are important as our second line of defense. Keep it simple! Work hard, use good form, make it count, and mix things up. Load those muscles and give them something to work against, whatever it is - bodyweight, dumbbell, medicine ball, kettle bell, barbell, stretch cord, cables, Ergometer, whatever! Again, this is but one example I came up with in about 5 minutes. For each workout, I mix up the exercises making sure I am using a variety of grips, widths, and angles of resistance but I don't worry much about the specifics. For this, I opted for a circuit. That involves multiple exercises done in succession without a break then repeating the "circuit" several times. My son Grant was my cameraman! Interruptions to normal training flow are annoying, but they are a chance to get creative! With tomorrow's forecasted 80% chance of rain, I decided to move tomorrow's workouts to today and move my off day to tomorrow. Little did I know today came with a 100% chance of dog bite. I had a 90 minute upper aerobic/hill ride and headed out on a familiar route. 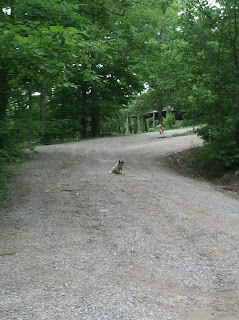 Coming up a somewhat blind twisty hill (North Fork and Seneca Hollow), I was met by two yapping dogs that I have seen on the road before but I had avoided, till now. This time the blue heeler made contact with my left ankle, tearing my new Castelli socks (nooo!!! ), breaking skin, and causing some slight bruising. I nearly went down. Man those dog jaws are strong! I stopped and figured this was something that needed to be reported. As I waited, another cyclist stopped, we chatted, and he went on his way (more about him in a second). Two animal control officers came in two trucks, the neighbor gave them the owner's info, and the dog was loaded in the back of a truck. 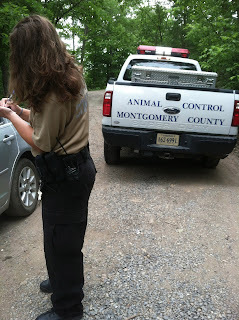 They explained that most likely the owner will be permitted to pick up the dog and quarantine the dog at home for 10 days. I am supposed to be contacted by the health department. I thought it odd that they didn't look at my ankle or take pictures or anything. 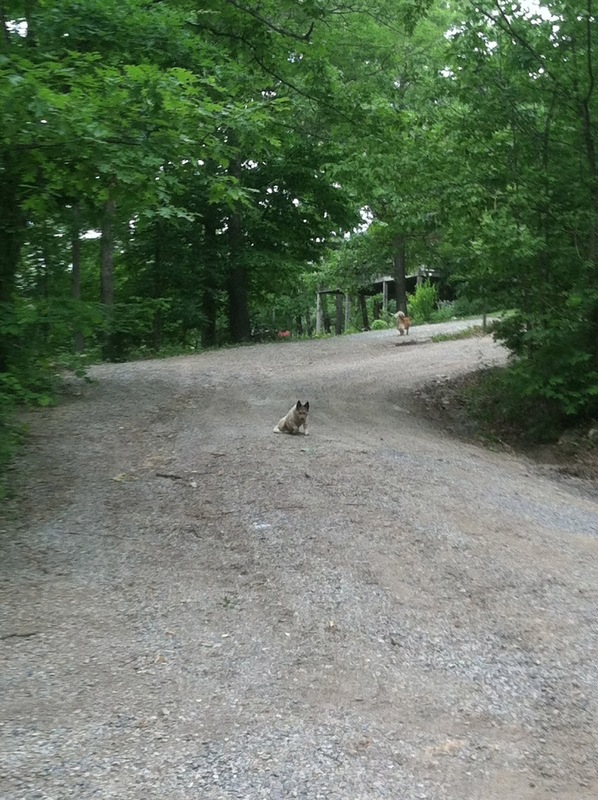 I'm sure this dog was doing what it thought it needed to be doing - herding me or whatever. So I feel kind of bad. On the other hand, the owner should know the danger they are potentially causing to other cyclists. I got off pretty easy, but another rider could go down and in that low visibility bend, could be run over. 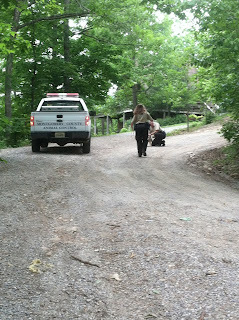 While I met with animal control, the cyclist I talked to had circled back around to report he'd been chased by two pit bulls one street over. Animal Control said they'd had complaints and left a note but hadn't heard back from that owner. Geez! It's dangerous out there. Anyway, I carried on with my ride dodging chipmunks and squirrels and jumping at the sound of every dog bark. I still managed 29 miles in 1:34 with 3100 feet of elevation gain, even with all that extra drag of a ripped sock! LOL. Be safe out there people!! How well are predicted times reflected in actual swim rankings in a pool swim triathlon? Subtitle: fun with non-parametric statistics! Sub-subtitle: getting my nerd on. On my run yesterday when I should have been thinking about cadence or something like that I was busy wondering whether or not our swim order for the time trial start at Sunday's pool swim triathlon was close to the swim time order outcome. We were intended to be lined up fastest to slowest, but were we really? 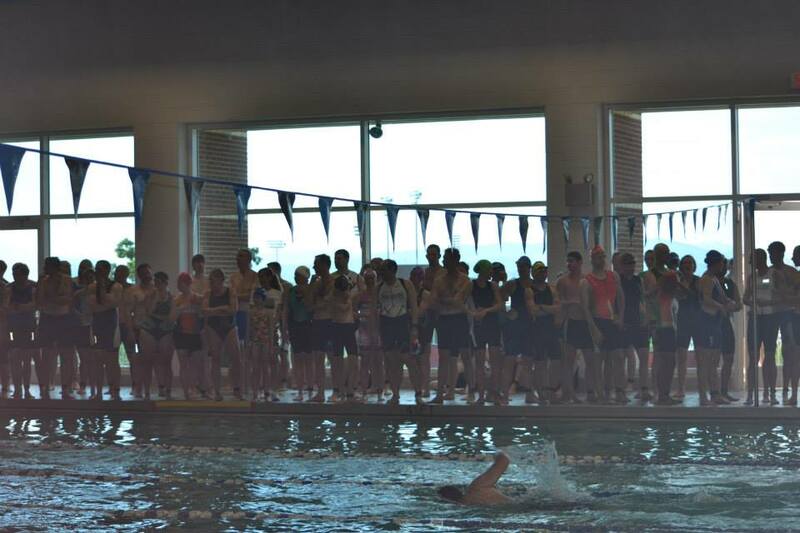 We were "seeded" fastest to slowest based on the times we submitted - our 100y swim time that we could maintain for 300y. Our bib numbers reflected that seeding. So the athlete who submitted the fastest time was "1" and the next fastest was "2" and so on. I was 44. The researcher in me asked, "how well did we self-seed ourselves?" Were we ordered relatively correctly, did we submit/guess our right time, resulting in the right order? 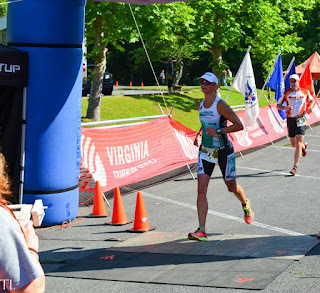 So I pulled the Salem Sprint Tri results into a spreadsheet and got to work. I took out the two late entries I knew who had high bib numbers because they registered the morning of the race and their number did not reflect their seeding. There may have been others, but I didn't assume so. I renumbered the seeding and the final swim rankings to account for the two pulled entries and any no-shows resulting in two columns of ranked data, 1 to 162. I plotted the data, shown on the graph below. The X axis is our swim order (denoted by our bib number) and the Y axis is our actual swim rank based on our 300y swim time (plus the run to the transition mat which introduces error). If we'd ordered ourselves perfectly, the data would all fall on the red line. 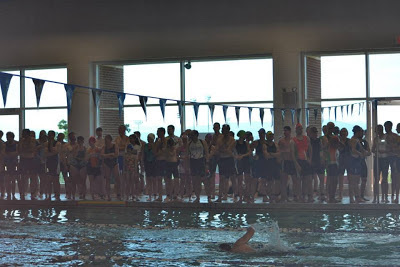 Those above the line were seeded faster (too far up in the swim lineup) than they should have been; those below were seeded slower (too far back in the swim lineup) than they should have. 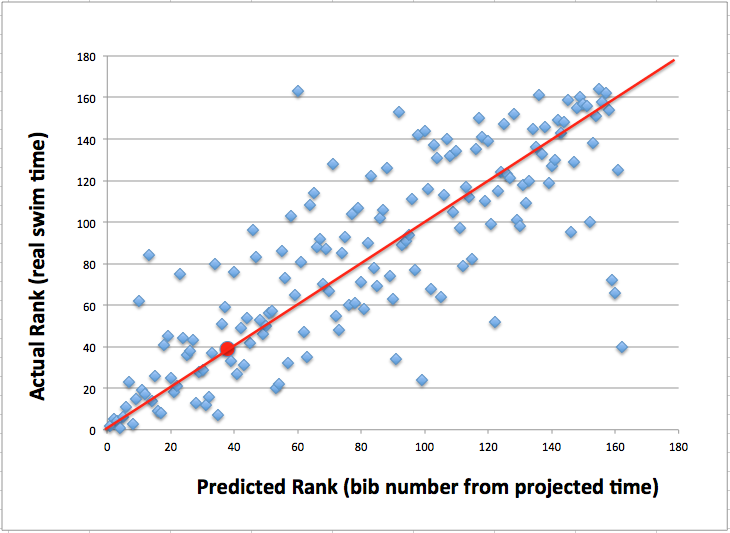 I am the red dot on the graph, I was pretty close to right on - seeded 38, finished 39 with the adjusted rankings. If you are a dot far away from the line you probably created a logjam and should re-evaluate or get a new watch! I calculated the Spearman Rank Order Correlation Coefficient and got 0.806 with a p less than 0.0001 meaning it's a significant finding. A correlation of 1.0 would be perfect meaning we'd all fall on the line. (I couldn't use Pearson since it was ordinal data only). Really, we didn't do too bad a job. The funniest thing is how long it seems to take us to put ourselves in numerical order from low to high on race morning even with giant numbers on our arms. If I'd had the estimated times I could have correlated those with actual times and used Pearson...but I digress. I found no significant gender differences so men and women were equally capable (or not depending on your view) of predicting swim time/self-seeding. I'd like to thank my PhD adviser Dr. Tonya Smith Jackson for helping me to appreciate the beauty of statistics, especially non parametrics which are still my favorite!! 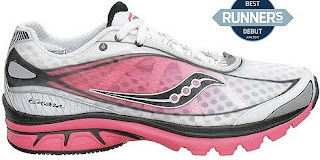 By the time I finally get around to ordering a new pair of running shoes, my old, beloved, trusted model is usually long gone. I scour the online sources...shoe stores, Amazon, eBay....and at times I've gotten lucky. But more typically, not. I grieve. I search. I bravely try to keep my chin and my cadence up. Each time it seems to get harder. The breakup with the yellow shoes was particularly crushing. They carried me through an amazing 2012 season. Why don't I just order several pairs at once? Well, that's risky. Sometimes shoe love is instantaneous and passionate, but turns out to be blister-inducing and short-lived. I don't want a shoebox stack of reminders of failed shoe relationships. Other times it's a slow-growing love, and by the time I realize I'm forefoot-over-heels in love, it's too late to find more. Thin-soled and broken down, I begin the search for a shoe anew. These were my 2011 favs. These were going to be my 2013 shoes, but this relationship is wearing out. And no, I'm not telling you what shoes I have ordered lest I should love them and need as much inventory out there as possible! !